Original cover by Brian Bolland; DC 1991. Ben Perkins's website is here. I actually like some stuff on Ben's personal blog, but I'm really not feeling this piece. Frankly, I think for the past while Rejected by Covered http://rejectedbycovered.blogspot.com/ has been posting more consistently great work than Covered. Thanks for the plug Anonymous commenter! FWIW: I really dig Ben's cover. 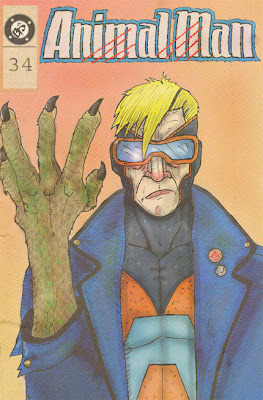 His costume design is waaaay better than the original (love the goggles!). 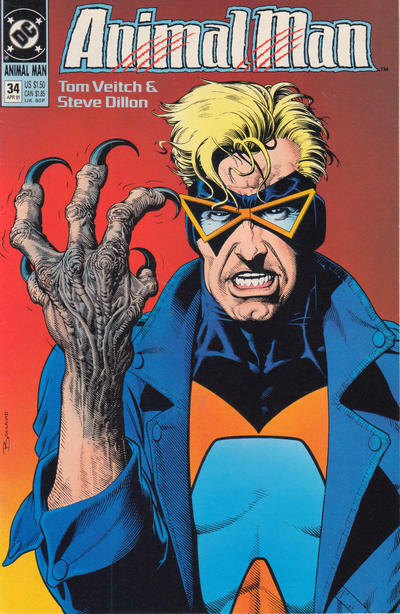 It gives Animal Man sort of an '80s New Wave Punk look. I totally agree with my anonymous mate up there. It's worth nothing that Rejected By... runs way fewer covers, though. Still a shame that most of those were rejected. Especially when so many of those that make it are samey crayon sketches and such. I really dig the nose and the scowl. Top notch both.